Pond water testing should be an important part of every pond owner’s maintenance routine. The reason for this is because it is the best way to measure the pond’s overall health. Some of the things which you will determine by testing your pond water include the pH, nutrient levels alkalinity, conductivity and bacterial presence. Below we will go over the role that water testing plays in maintaining a healthy and vibrant pond environment. 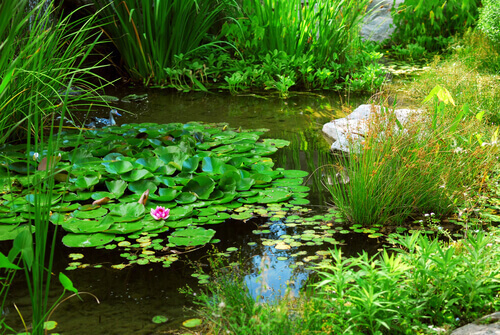 Declining water quality is a serious and common problem in both ponds and water gardens. Ponds are subject to entropy and must be regularly maintained in order to prevent them from falling into disrepair. Over time pond water will accumulate leaves, dead plants, grass and other forms of matter. When these objects are allowed to remain in the water for long periods of time this will lead to the release of toxins that will harm any fish or plants that live in the pond. Correcting the problem after it has reached this point will be both tedious and costly. Testing allows you to determine where your pond stands, and by doing it regularly you’ll be able to identify problems before they become big and costly to fix. Understanding the nature of the problem in regards to your pond water will allow you to develop a pond management strategy which can effectively resolve it. Water testing is also important in situations where you want to enact a program for nutrient remediation. There are few pond owners who aren’t familiar with algae. No matter where your pond is located if the plants within it are exposed to excessive amount of sunlight algae growth is virtually guaranteed. The presence of too much algae in pond water can adversely affect its quality. Algae are especially a problem for newly constructed ponds as they do not yet have a correct equilibrium between animals and plants. Installing equipment such as pumps inside the pond will help control algae growth. Koi ponds typically have fewer plants but will need more advanced filtration systems to maintain optimal water quality. The pump will keep the water moving and the filter will keep it clean. Water testing is crucial because it will allow you to determine the pond’s nutrient levels which can be an indication of future problems involving algae. Water testing is also essential because it will give you the ability to monitor the effects of land use within the watershed. It must also be noted that some herbicides and algaecides are more efficient in specific water conditions than others, so they should always be used with a grain of salt. Constructing and installing a pond is no simple task, but failing to regularly test your water can undermine all the hard work you put into creating it. Regular testing is the key to preventing disastrous problems and maintaining a pond which is vibrant and pleasing to the eye.